Looking to bolster in-depth local journalism, major Long Beach news agencies have come together to collaborate on a series of stories that will examine a single issue affecting the community. 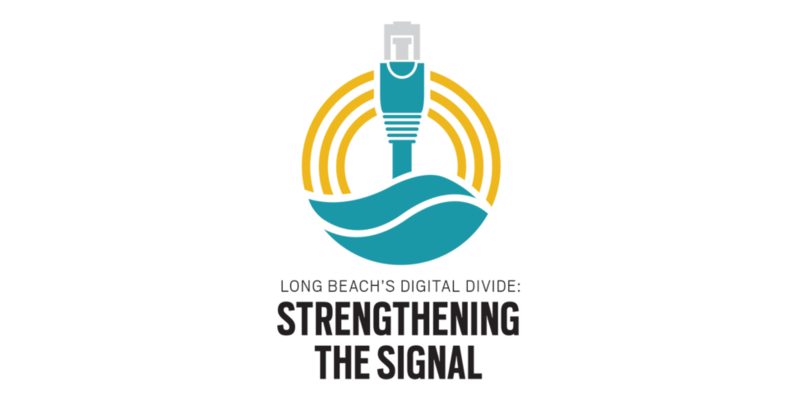 Over the following months, the newly-minted Long Beach Media Collaborative will report on why more than 15 percent of Long Beach residents still lack Internet access at their homes, why that is a meaningful statistic that deserves public attention, and ways that the “Digital Divide” might be bridged here. This is the first time that a collaborative model of journalism has been tested in Long Beach, and we hope that readers of all four news sources—the Long Beach Press Telegram, the Long Beach Post, the Grunion Gazette and the Long Beach Business Journal—will engage with the series, titled Strengthening the Signal. Each newspaper will tackle different parts of the project, and all of the stories will be available at longbeachmc.com upon publication. The Long Beach Media Collaborative was initiated in August 2016, when Long Beach Community Foundation President and CEO Marcelle Epley reached out to publishers and editors at the four news agencies to gauge their interest in such a project. As leaders in a traditionally competitive industry with varying ideas about the delivery of news, it was not, at first, an easy sell, Epley said. By unanimous vote, the collaborative decided to tackle a widespread yet overlooked and underreported concern in the city: More than 15 percent of Long Beach residents lack Internet access in their homes, and most of those aren’t connecting outside of their homes, either. Thanks to a grant from the Knight Foundation, the Long Beach Media Collaborative will look at why, in a metropolitan city that has styled itself as a technology leader in an increasingly digital world, nearly one-sixth of the population is not logging on. Among other things, we’ll dive into the economic causes of the divide; the effects that lack of reliable Internet access can have on student performance, prospects for higher education, future employability and economic mobility; the importance of a technologically literate workforce to businesses and the local economy; how the problem has been tackled elsewhere to varying degrees of success; and what programs and policies could be put in place locally to help bridge the divide. While this is a first for the Long Beach news ecosystem, the collaborative reporting model isn’t a new one. Understanding the importance of in-depth reporting at a time when publications are struggling to keep up in an ever-changing media landscape, the Knight Foundation reached out to community foundation nationwide in February 2016 asking them how they could support investigative journalism, according to Epley. Every collaboration, however, just like every news source, is different; over the past several months, our four institutions have come together to learn and discuss best practices to deliver collaborative reporting, engage our varied audiences and work together as colleagues to bring our city the best possible coverage of this important issue. Now, our research and reporting is taking shape and as we begin to roll out articles in the coming weeks we ask you to join us and engage with us as we explore the digital divide in our special series, Strengthening the Signal.